Sometimes it seems that a great movie can just pop up out of nowhere. I shouldn’t really be saying that about this one considering this is the time of year when a lot of the great movies come out and also the fact that this particular film was getting a fair amount of buzz. 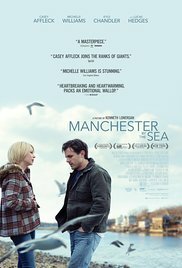 When I first heard of Manchester by the Sea I was determined to see it because of the praise that was being given to Casey Affleck, one of my favorite actors. I went to the movie not knowing too much of what the plot was or who was involved with the production, but looking back on it, Manchester by the Sea is one of the stand out films of the year and one of the most honest and down to earth stories I’ve seen in a long time. Lee Chandler (Casey Affleck) is a janitor for an apartment complex in Quincy, Massachusetts who is known by the tenants for his often volatile personality. One day he gets a call to let him know that his brother, Joe (Kyle Chandler), has died which forces Lee to return to his home town of Manchester-by-the-Sea for the services and to also look after Joe’s son Patrick (Lucas Hedges). This return to Manchester opens some old, deep wounds that Lee has been running from for years that are only made worse when he finally runs into his ex-wife Randi (Michelle Williams), and the two begin talking for the first time since a tragedy forcefully pulled them apart. As Lee starts to deal with his past and the problems he is presently facing, a bomb is dropped on him when it’s revealed that he is now the legal guardian of Patrick, a responsibility that seems so far from what Lee is capable of. 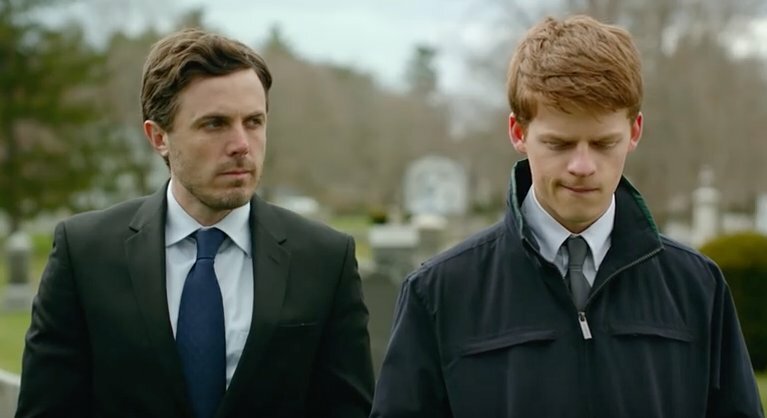 There are so many really impressive things about Manchester by the Sea from the way the story is told to the actors responsible for bringing all of the poignant scenes Kenneth Lonergan created to life. In terms of story, it’s simply beautiful and it’s so beautiful because it’s so real. There’s nothing glamorized in this movie and the drama feels like it could happen to anyone including yourself. The idea of having a death in the family, especially someone as close as Lee and Joe were, is a very upsetting thing to think about but the story never becomes so upsetting that all the hope is lost. People deal with loss in different ways including lashing out at other people or hiding behind a sense of humor. This movie explores all of these ways and it surprisingly made me laugh more than a few times. In one scene, Lee and Patrick are having an argument while they walk up and down a street looking for where they parked the car. This frustration of forgetting where they parked adds frustration to their argument and fuels the fire. This is a great scene that perfectly illustrates the real scenarios that are relatable to the viewer. Part of what made this movie connect with me so much actually had a lot to do with the location. Manchester is shot like it could be Anytown, USA. There’s something really familiar about the businesses and the homes that just put me at ease with where I was. Like I said, there’s nothing glamorous in Manchester by the Sea and that includes the way the settings and people are shot. None of the characters look like movie stars, but are made up to look like they could be anyone’s next door neighbor. It reminded me a lot of British realism in the sense that all of this could be happening next door from you and you may not even know. Lonergan has truly crafted a story that can speak to anyone, no matter how cold and jaded you’ve become. On to the reason why I really wanted to see this movie. Affleck has been getting a lot of attention for his performance in this movie and he deserves every bit of it. He gives an understated and honest performance, but he also just fits right into the location like he’s been there all his life. There are some scenes that require him to really put energy into the drama, but there are so many great scenes that are much quieter and you can see just by his face that the gears in his head are turning and turning fast. Lucas Hedges also gives a surprisingly great performance as Patrick, and the two leads work great with each other. It’s a very real relationship they have and the conversations we get to listen to happen so naturally. Finally, Michelle Williams is always one to give a strong performance and her tragic character in this film is clearly and accurately brought to life. Manchester by the Sea snuck up on my out of nowhere and has become one of the strongest and most memorable movies of 2016. It’s a pretty long movie and it can be argued that not much happens in the slow burn of a storyline, but I’d argue that. This is a very deep, complex, and emotional story that’s acted by some of the best in the business and realistically brought to life by writer and director Kenneth Lonergan. It doesn’t so much succeed as a drama as it does in showing life and humanity in the most organic way you can see on film. Manchester by the Sea is required viewing. The golden age of Hollywood is a very unique time for American film. This was a time when actors were a commodity for a studio and the idea was more important than a director’s vision. While this is true for most films of this time, there were exceptions to that rule. 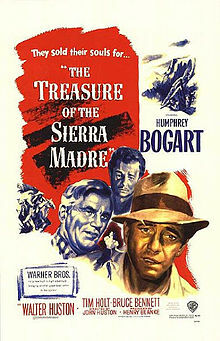 With that said, The Treasure of the Sierra Madre is one of the biggest exceptions, and took major risks for that time period. When I think of character arcs that grow and eventually take a turn for the worst, while also showing the viewer what’s wrong with society, I think of the movies of the 1970s by auteurs like Martin Scorsese and Francis Ford Coppola. The fact that The Treasure of the Sierra Madre was released in 1948 and featured this level of dark development and cynical humor made this film something that would live on forever with lovers of the medium. After failing to find any real kind of income in the Mexican oil-town of Tampico, Mexico, two drifters named Dobbs (Humphrey Bogart) and Curtin (Tim Holt) are close to giving up their efforts. Luck starts to shine one them, however, when Dobbs wins a small lottery and the two meet a prospector named Howard (Walter Huston), who tells them of the abundance of gold hidden deep in the Sierra Madre mountains. The three men soon set out on their adventure to dig up the gold and make their fortune. Trouble waits for them along the way, including a gang of ruthless bandits, but that’s just where their troubles begin. The trio soon begin to get very suspicious of each other and how much they can all trust each other. It soon boils down to a game of last man standing to determine who will get the gold and the fortune that goes along with it. Like I said before, this is a pretty dark and cynical movie that certainly didn’t pander to audiences of the time period. Anyone who looks at the posters or trailer for this movie when it was first released could swear that The Treasure of the Sierra Madre was a straight up adventure story. Well, they’d be surprised to find out that it most certainly wasn’t. Jack Warner was very excited about this movie and gave writer and director John Huston complete control over his film, but Warner was also very concerned with how to market the movie once it was finished. This movie is more of a character study of Dobbs more than it is anything else, and at times, the film got pretty cerebral which was unexpected. A lot of the success of this movie, along with John Huston’s superb direction, can be associated with Humphrey Bogart’s thrilling performance. Now, I’m going to say something that may sound pretty outrageous, but I’m not really that huge a fan of Humphrey Bogart. His acting in most things is pretty standard and I find him to be a little overrated. He pretty much plays the same range of character in any movie I’ve seen him in. Of course, the theme of this movie’s history can be titled “exceptions to the rule” and this is another one. Bogart is simply outstanding in his performance as Dobbs, a character who goes from one trouble to another and by the time the movie’s over, it’s all finally caught up and has become too much for him to handle. At first, Bogart plays the role pretty subtly, but as the story progresses, he lashes out more and more and becomes almost unrecognizable by the end. This is one of the finest character changes in this history of film, and it’s all thanks to Bogart’s ever changing demeanor and this rare time that he literally seemed to become somebody else entirely. 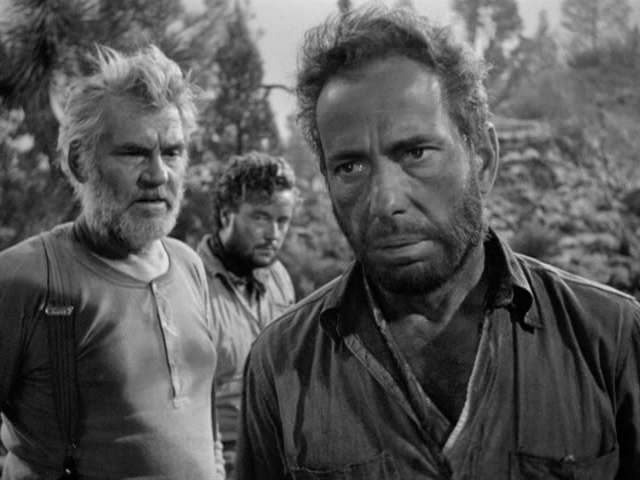 While The Treasure of the Sierra Madre isn’t an adventure movie per se, it does have it’s fair share of adventure. There’s plenty of shoot outs and tense interactions that give this movie some real excitement. It’s interesting to note that at the time this movie was being shot, it was relatively new for Hollywood film makers to shoot a film on location, especially when the location is as brutal as it was for this film. Some of these scenes were shot on back lots and in the studio, but a lot of the film was actually shot in the deserts of Arizona and Mexico. This made for a really grueling shoot filled with loaded tempers, but it all paid off in the end. Shooting this movie on location gives it a sense of realism that adds to the darker, more realistic tones of the movie as a whole. I couldn’t have seen it working as well as it did if it were all shot in studio. The Treasure of the Sierra Madre is a movie far ahead of its time that shares similar themes and characterizations that would become more known with movies of the 1970s. There’s plenty of adventure and entertainment stuffed in the story, but the most fun I had watching this movie was seeing an average character fall way too deep into his own head and become paranoid beyond repair. This film works best as a character study, but that doesn’t mean it can’t have thrills along the way. The Treasure of the Sierra Madre has certainly earned the right to be called a classic and named one of the best American films of all time. I’ve reviewed some of Christopher Nolan’s work before, and as I’m sure I’ve said, he is one of the current most powerful forces in Hollywood. After dazzling critics and less mainstream audiences with Following and Memento, he was granted his first studio film. Insomnia, based off of a Norwegian film by the same name, is an interesting twist on the noir genre that also plays heavily with flawed human psychology and morality. The result is a crazy story with beautiful cinematography that is very well made and interesting, yet not Nolan’s best work by far. Will Dormer (Al Pacino) and his partner Hap Eckhart (Martin Donovan) are to LAPD detectives assigned a job in Nightmute, Alaska to help solve a mystery concerning the murder of a seventeen year old girl. Upon arrival they meet Ellie Burr (Hilary Swank) a young police officer who has studied Dormer’s work in the past and informs them that at this time of year, the sun doesn’t set in Nightmute. Eckhart soon tells Dormer that he will be cooperating in an internal affairs investigation that may end up ruining Dormer’s career and after an accidental tragedy strikes, it appears the hammer may be falling on Dormer sooner and swifter. As he begins losing sleep for days at a time, he is contacted by Walter Finch (Robin Williams), a writer and the person responsible for the girl’s death, but he is also the person that may get Dormer out of trouble. In my opinion, the real star of this movie is the cinematographer, Wally Pfister, who’s went on to work with Nolan on every one of his movies since Insomnia. Being a neo-noir film, you would think that there would be a lot of shadows and darkness, but the interesting twist of taking place in an area where the sun doesn’t set gives Pfister a lot of room to play around with light and shadow in a way unconventional to the genre. The Alaskan setting is also filmed beautifully with mountains, lakes, and forests contrasted with small towns give the film a unique look. 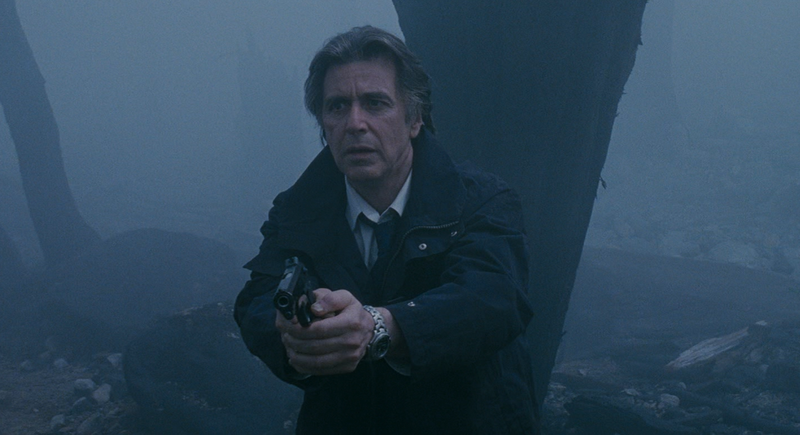 The best looking part of the movie is a chase through fog which gives the viewers the same sense of uncertainty as the characters. I need to give credit to Al Pacino and Robin Williams here too. They both knock it out of the park with their roles. Now, this may sound kind of naïve, but I was expecting that with Al Pacino. I always look at Robin Williams as more of a funny man, although I’m aware of his professional training in acting and his work in dramas before, but never a murder mystery. I was really into his performance here and he actually did a great job at making me feel uncomfortable. Insomnia is a movie with a multi-layered story. There is a whole lot happening in the movie that you really need to wrap your head around all of it, and that isn’t always easy. That being said, I really like the story in this and it is perfect for Christopher Nolan’s direction, who’s always had a talent with dealing with strange situations. 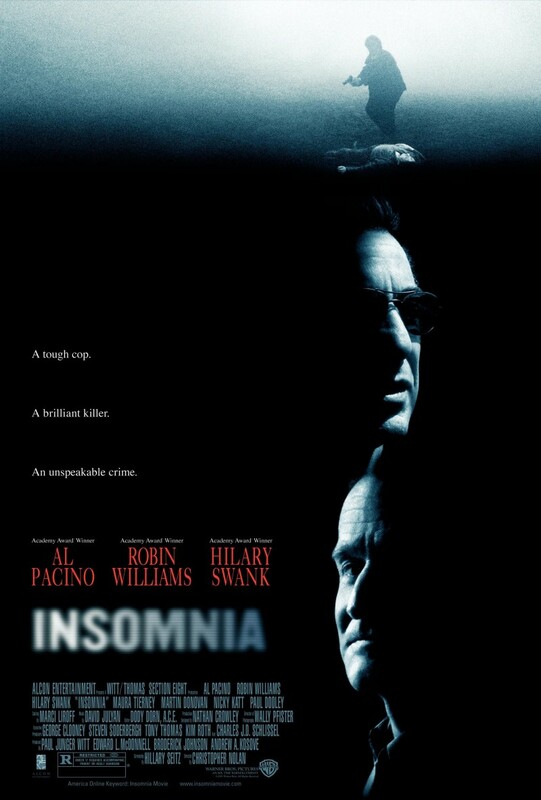 Still, compared to Nolan’s other pieces like The Dark Knight Trilogy and The Prestige, Insomnia doesn’t quite hold up to them. It just doesn’t have the power that his other films have, nor does it have a very satisfying conclusion. Christopher Nolan’s remake of Insomnia is a cool movie with a lot of cool ideas and a plot that takes it just a step further with all of its devices and twists. Something just doesn’t let it sit in the upper echelons of modern film with Nolan’s other movies. This is a more than adequate neo-noir psychological thriller, but it just didn’t really go as far as I wanted it to. Maybe that has to do with the conclusion which just sort of happens, leaving the movie to just drop off. Still, if you’re interested in Nolan’s work then Insomnia is a movie you should check out, even if it’s just to see it once. The job of anyone that is crafting a tale of mystery that takes place in any form of media has a very important, and I’d argue, difficult job. They have to make it intriguing in such a way to keep the audience in the dark and always guessing. Now, the Japanese cult phenomenon director, Takashi Miike, has dabbled in pretty much every genre in his unbelievable filmography of over 90 movies, and Detective Story is his combination of mystery, dark comedy, and his own brand of sick horror. 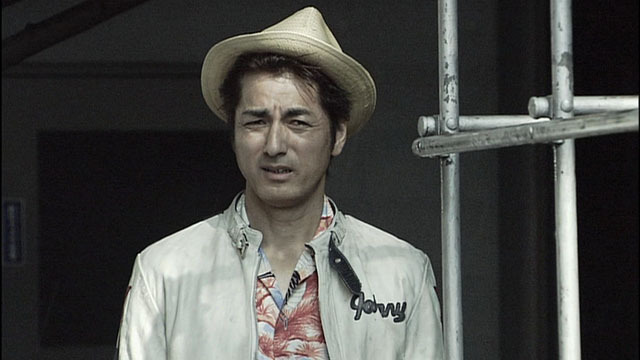 Raita (Claude Maki) is a Japanese business man who has recently moved into a new apartment. Coincidentally, Raita’s new neighbor is also a man named Raita (Kazuya Nakayama), a private detective who doesn’t really have both feet planted firmly on Earth. Detective Raita soon begins investigating a series of bizarre murders, in which the victims have had certain organs removed after they were killed. Evidence against the private detective is soon uncovered, so he pulls the business man Raita into the mix of things for help, and the two plunge deep into a sickening quest to clear the detective’s name and solve the mystery of these brutal killings. There are things in this movie that remind you that you are watching a movie by Takashi Miike. The film was actually written by someone else, but Miike’s style is certainly injected into the story, mostly by the use of his twisted sense of humor and the brutality of some of the scenes. This definitely isn’t as gut wrenching as other films of his like Ichi the Killer and Audition, but Detective Story does have a fair share of scenes that will make the viewer squirm, but laugh at the same time. The story is pretty muddled, as is the case of a lot of Miike’s films, but the difference between Detective Story and the other ones is that the others have things happening that really catch the viewer’s attention. The films I already mentioned have a sickening amount of over the top gore, and a movie like Sukiyaki Western Django has pretty insane action and art design that kept me interested, even when the story sort of fell through the cracks. Detective Story doesn’t really have any of this. The beginning and ending are both strong and grabbed me, but the entire middle part is filled with people just running around, doing a whole lot of what seemed like nothing. I felt like the plot got stuck in the mud and was just moving for the sake of a run time. Now, there are really cool scenes, don’t get me wrong. Unfortunately, my copy of the movie had some things awkwardly blurred out, which kind of pulled me out of the movie for a second. Still there are other scenes that will shock, and others that will make you laugh. Nakayama’s performance is gleefully silly which is nice in a movie that had the potential to be so morbid. A lot of the humor in this movie comes from Nakayama’s ineptness getting in the way of him and anyone else solving the case. There are also a few gory scenes that will be remembered, but that doesn’t really make up for what is a really boring movie. 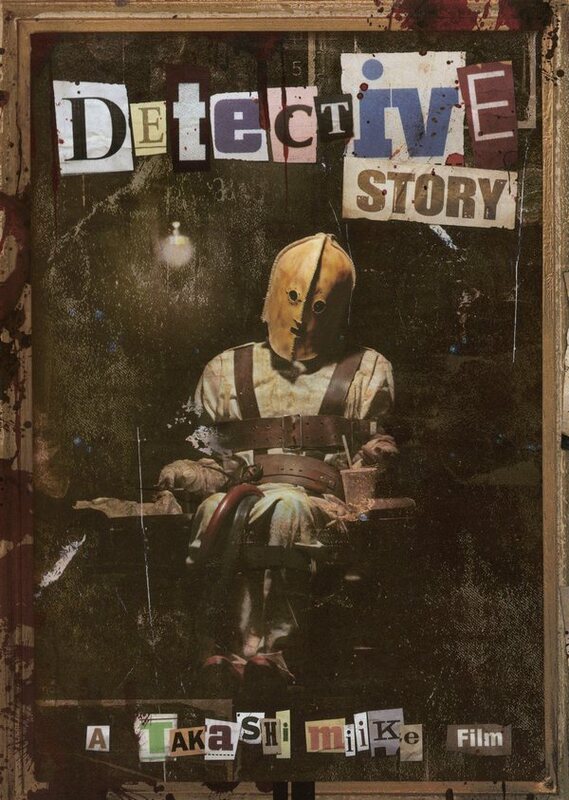 I don’t really have much to say about Detective Story because it’s pretty forgettable, save for a few scenes. The story gets so caught up in itself and has this weird way of moving that I felt like I was missing stuff, but it turns out nothing was really happening. I can’t say I was really expecting too much from this movie, but I will say that I expected more. Fans of Takashi Miike will want to see it for his strange sense of humor and a few cool gory scenes, but the rest of the movie falls short and will kinda fade into my memory until it is hardly remembered. Norwegian folklore is ripe with creatures and stories to make a million different movies about, and that’s exactly what André Øvredal attempts with Trollhunter. Trolls have become an international creature that has gotten their days in different fairy tales, books and their film adaptations such as The Lord of the Rings and Harry Potter. Trollhunter shows trolls like I’ve never seen them before and through the eyes of the people whose ancestry created them. That combined with the faux documentary style captured my attention immediately and I was convinced that this movie would not disappoint. A group of Norwegian college students are out in the country to make a documentary about a supposed bear poacher named Hans (Otto Jespersen). At first, he wants nothing to do with the crew, but eventually lets them in on his little secret. He is actually a trollhunter. The crew joins Hans on his mission to hunt down trolls that have wandered off of their own territory, and using a very large UV light that mimics the sun, turn them into stone or, in some cases, make them explode. This is a very dangerous job that has become even more dangerous since something is causing the trolls to be increasingly violent towards humans, ending in a climax that puts even an experienced hunter like Hans face to face with a troll that may be the end of him. So much imagination went into this movie. SO much imagination. I just could not get enough of this movie as I was watching it and when it was over, I was still left so excited from watching it that I almost refused to accept that it was over. 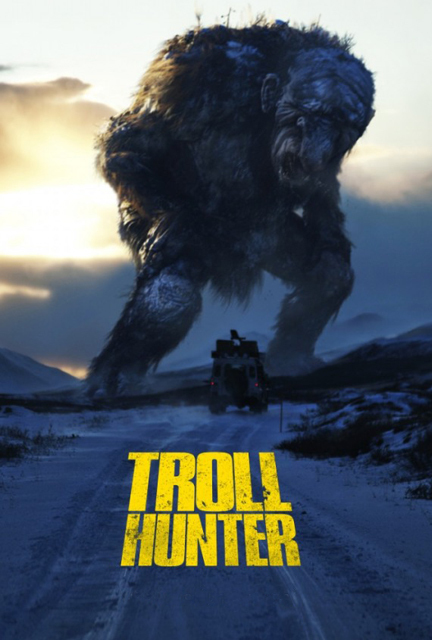 I feel really great about Trollhunter, because it isn’t everyday that I watch a movie with such high expectations, but then have the movie meet them, and even surpass them. Something strong this movie has going for it are the visual and audio effects. In fact, they kind of steal the show in my opinion. The trolls all look fantastic, especially the towering Jotnar that could crush the crew’s jeep with its pinky. But the trolls don’t just look great, because they may sound even better. The design of the different roars and grunts that the trolls make are so cool and booming, and at times, creepy. The first revelation of the trolls in Trollhunter are so memorable, because we can hear them before we can see them. This makes the sound even more important because we, as an audience in suspense, have to get curious about these trolls and then have the visuals impress as much as the sounds. 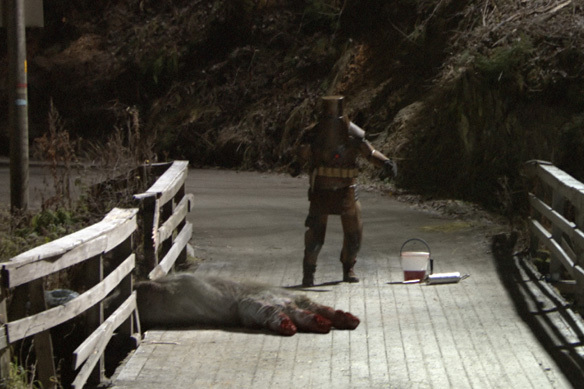 Having Trollhunter shot like a documentary is really the only way this could’ve been pulled off. It isn’t often that I think about how a movie would be if it was shot like this or not, but in this one it makes all the difference. Trolls are such deeply mythological creatures that realistically showing how real they can be makes for a very interesting concept. Plus the handheld camerawork and night vision make for some of the best scenes in the movie. 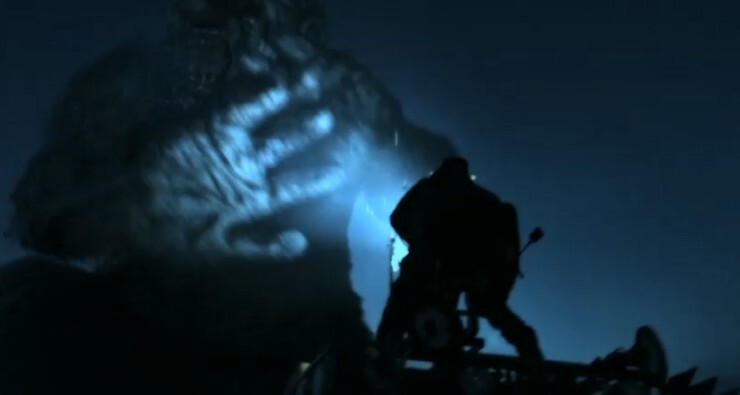 Trollhunter isn’t just sold on the camera work and design however. Otto Jespersen as Hans knocks it out of the park as the deadpan trollhunter. Hearing him calmly, almost as if bored out of his mind, deliver lines about trolls and their physiology are hilarious and make up most of the humor in the movie. Believe it or not, and I don’t know how many people would agree with me, but I would say Trollhunter is officially one of my favorite movies. The whole idea of bringing trolls into reality in such a down to earth (sort of) way is great! Add a bunch of dead pan humor and excellent visual and sound design and you got yourself an awesome movie. Even if you’re hesitant about Trollhunter and think the whole concept is iffy, give it a watch anyway because you just might find yourself having a better time than you would have thought. The film world is a much quieter place without Tony Scott. It was really upsetting to me this past year when I heard of his suicide. He was an action film maker who did more than make derivative movies. He invented a kinetic style that made the world the action was taking place in hyperrealistic. With camera work that jolted the viewer all over the place to the highly saturated cinematography, you knew you were watching a Tony Scott movie without even needing to look at the credits. With films like True Romance and Man on Fire, Déjà Vu is certainly not his best, and I doubt if this is the movie that comes to people’s minds when they talk about Scott’s filmography. 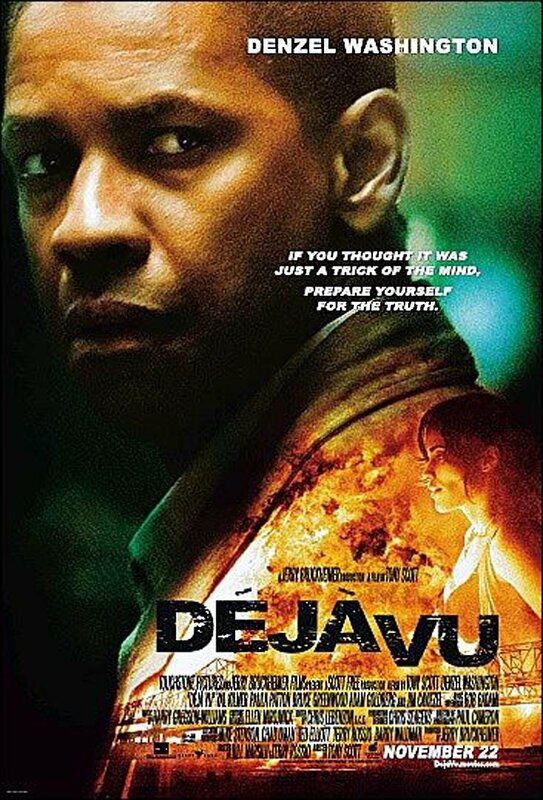 After a ferry explodes in New Orleans on Mardi Gras, ATF Agent Doug Carlin (Denzel Washington) is brought in to investigate. He proves himself as a worthy investigator and is recruited by FBI Agent Paul Pryzwarra (Val Kilmer) to join a special task force involved with this investigation. “Special” is an understatement, since this crew has technology that is able to bend time and space and look back into the past on a very specific delay. This ability leads them to look into the life of Claire Kuchever (Paula Patton) who was found dead near the area of the ferry explosion. 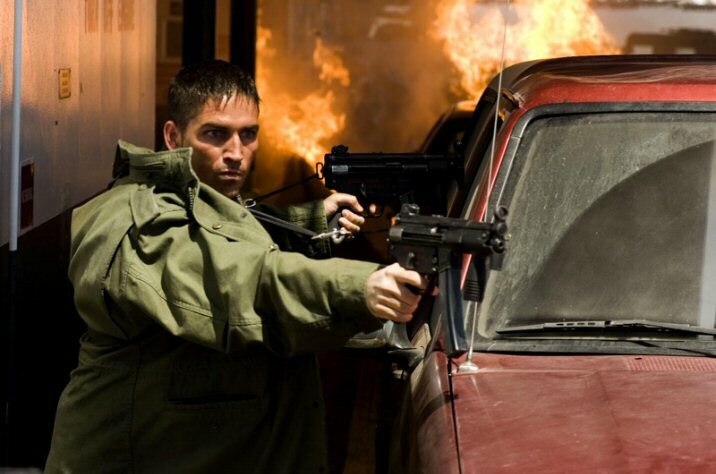 What Carlin and the agents find by looking at Claire’s past is a terrorist (Jim Caviezel), whose targeted her to unwillingly assist him, unless Carlin can somehow travel to the past and save Claire, thereby saving everyone on the ferry. What separates this from a lot of other more derivative action films is the gimmick of time travel. If this was about Agent Carlin and the investigation about the ferry and the terrorist who committed the crime, this would be a completely forgettable and unremarkable movie. The time travel aspect, and the technology behind it only serve to make the film a little bit more interesting than it could have been. Unfortunately, the movie is almost overblown with dialogue trying to explain the technology, but it isn’t very interesting. When the actually action involving the machine is put to use, it isn’t all that exciting, save for a few moments. Being a film that’s over two hours, the element of seeing through and traveling through time is a missed opportunity. There isn’t even a whole lot of action in this movie to keep me occupied. Like I said, there is a lot of talking in this movie, and a good portion of it is technical mumbo jumbo. There is a pretty cool car chase in the movie that includes the bending of time, which is an example of how the gimmick of the movie can be put to good use. The other scenes of action are brief, but exciting. Still, there isn’t enough excitement to keep me fully entertained or on the edge of my seat, which is odd for a Tony Scott movie. Let me just touch on the element of time one more time, no pun intended. It really bothered me how it’s used here when it could’ve been so much better. Time travel is really cool and fun, despite each movie being totally illogical in its own way, but Déjà Vu takes the cake for being the simplest and most uninteresting. The visuals still have that cool Tony Scott style that I’ve come to really enjoy about his movies. Everything is wonderfully over saturated and the camera work is so frenetic at times that it feels almost like a video game. That still doesn’t make the movie as good as it could be. Style over substance, in my opinion, can be passable as long as the movie knows that it isn’t shooting to be anything other than a stylistic roller coaster. This movie is not one of those. We are supposed to be completely involved with the weak characters and believe the dull plot device of time travel, all while enjoying the cool style. It just doesn’t work like that. 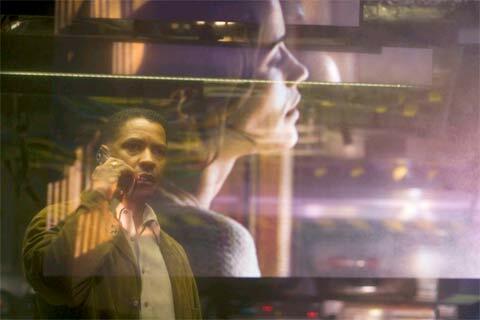 Déjà Vu is one of Tony Scott’s weakest entries to his filmography. While it seems like there is certain potential for this to be a legit sci-fi action thriller, it really doesn’t live up to the standards that it creates. Instead, this movie is going to be forgettable and never make it onto anyone’s future list of action classics. I can’t even say it’s a fun way to spend two hours, since the plot is so thick with dialogue that only twists for brain for no reason. Too much talking and not enough action makes Déjà Vu a bland attempt at a genre blending action film. In my last post, I made it quite clear that the first Scream film is a contemporary horror classic, and its follow up, Scream 2, wasn’t quite on the same level but worthy all the same. After these first two entries, the series was done with the nineties, but returned in 2000 with Scream 3, and then again 11 years later with Scream 4. One of the main reasons the first two Scream films are great is because the intelligent, sometimes scathing, satire that went along with the traditional horror fare. Unfortunately, these next two entries don’t live up to their predecessors and disappoint on many levels. Wes Craven was back, but Kevin Williamson was out. Already a rough start for Scream 3. Life has been rough on Sydney Prescott (Neve Campbell). In order to feel safe, she has secluded herself from society and rarely sees anyone other than her father. 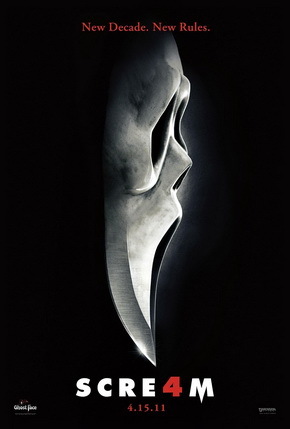 When a series of murders begin occurring, with the killer donning the Ghostface costume, and inquiring Sydney’s whereabout, she is brought out of seclusion and goes to Hollywood where the newest Stab movie is being shot. She isn’t alone in this, however, with Dewey (David Arquette) and Gale (Courtney Cox) returning to aid and protect her. As it is said in the film, the rules all change here, and a big reveal that changes everything we thought we knew is the only way to truly end a trilogy. If you to make a line graph showing all the Scream movies and their quality, this is where you would see a sharp decline. Like…sharp. Everything feels different, and not in a good way. First of all, Sydney gets little screen time, especially since she’s the main protagonist and was onscreen most of the time in the other films. But the biggest problem is the new screenwriter, Ehren Kruger. Kevin Williamson wrote a draft for Scream 3 as a point of reference, but Kruger dismissed pretty much everything Williamson wrote, and did his own thing. The result is not very good at all. Instead of taking shots at the horror genre and the ins and outs of a generation, all of the satire focuses on Hollywood, and turning it into this cartoonish hellhole that is populated by idiots and corruption. Sure, that does sound like Hollywood, but this is way too over the top. Bottom line is this: Scream 3 is silly in that stupid kind of way. It isn’t a complete disaster, and the twists at the end are cool, but this is a weak entry with a screenplay that seems like it was written by a high schooler who’s a big fan of the movies. The jokes are too direct and cheesy, the satire is misdirected, and the heroine that we’ve come to root for is in the movie for too little a time. Scream 3 should be seen if you’re serious about this series, but if you’re just looking for something to watch and aren’t really a fan of the others, than this can be skipped easily. Cut to 11 years later. In a world of reboots, it only seemed fair that Scream comes back to the silver screen and make self referential jokes about what kind of movie it is, and make a comment on the next generation of film goers. The result is… meh. 15 years after the Woodsboro Massacre, Sydney makes her return to her old hometown to promote her book. As luck would have it, Ghostface also has returned, threatens Sydney, kills some people, and sparks up a new investigation to see who is behind the mask. Dewey and Gale, who are now married, return to help Sydney, and Sydney’s cousin Jill (Emma Roberts) is caught in the middle of all of the violence that is engulfing her family and friends. As bodies begin piling up in a brutal fashion, the people of Woodsboro begin to realize that the rules of the game are all different, and anything goes this time. If this were any other horror franchise, I’d be annoyed to see it again thinking that there really is no need to bring it back. With Scream 4, I felt pretty comfortable with its return. Williamson is back as screenwriter and only does an OK job. That’s right. Scream 4 isn’t really anything special, but it’s a big improvement over Scream 3. The witty banter is back and it’s pretty funny hearing the characters talk about the rules of reboots. Hollywood is in an age where every other movie seems to be a reboot or a remake of some sort, so it was interesting hearing a movie produced in Hollywood make such blatant jokes about it. The film’s biggest failing is when it tries too hard. There are moments where the satire is so in your face and over the top that it falls flat and just comes off as annoying. We all get it. You’re making fun of reboots and the film industry clichés. This movie also seems to go nowhere fast for awhile then picks up the pace dramatically in the third half. 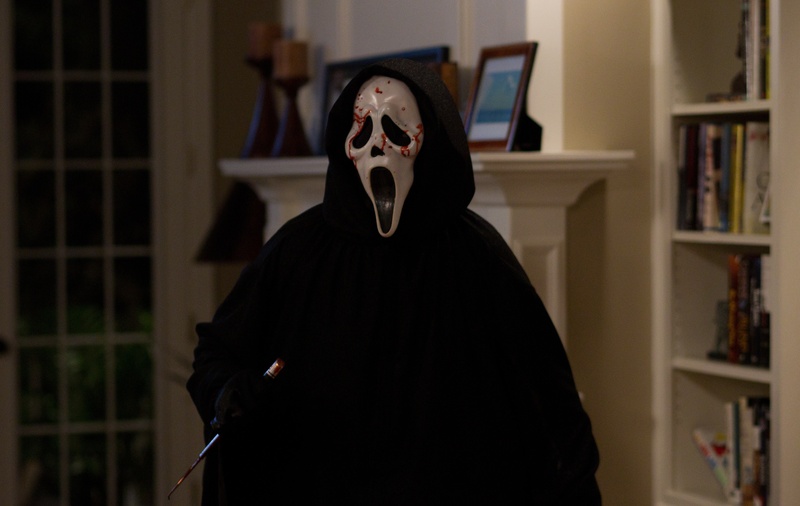 Scream 4 is a huge improvement over Scream 3, but still just doesn’t reach the same heights as the first two movies. I appreciate what it’s trying to say about the state of the film industry and this generation of film buffs, but it’s a bit too big for its britches and comes off as pretentious and annoying at times. That’s not what the Scream films are all about. They’re about laughing and fear, and then laughing at ourselves for being scared. Scream 4 is a good time and if you’re a fan of the series, give it a watch. I grew up with the original Scream trilogy, and these movies are a few that really helped get me begin to love movies to the degree that I do today. In that way, these movies are very special to me, and it was good to finally get around to seeing Scream 4. Despite the weaknesses that creep up in the last two movies, I can’t say that I could ever truly hate a Scream movie. Disappointed, yes, but hate is a strong word.